This 3.5" Color LCD SPI BoosterPack with Touch from Kentec features a large 3.5" 320 x 240 pixels screen with 256K colours and touch. The only difference with the Kentec 3.5" LCD With Touch BoosterPack for Stellaris is the interface: SPI instead of 8-bit parallel. The BoosterPack is very easy to install on the LaunchPads. The major benefit is using a limited number of pins, as the screen uses the standard SPI port instead of an 8-bit parallel connection. There's no built-in controller for the touch: the LaunchPad has to manage the touch resistor directly, through four pins. The BoosterPack is carefully manufactured and very clean. At less than USD25, this screen provides great value. Documentation is available at the Texas Instruments and the Kentec websites. The screen is compatible with most of the new LaunchPads, based on version 2 of the standard for BoosterPacks. However, there's a compatibility issue with the LaunchPads LM4F Stellaris and TM4C123 Tiva C, clearly explained on the User Manual. With the 0 Ω resistor R10 in place, pin 24 interferes with pin 15, so touch XP conflicts with MOSI signal. This means the screen doesn't receive any data from MOSI and stays white. What to do? Either remove this resistor, or don't use touch. Touch doesn't work with the LaunchPad CC3200, because of the 1.5 V limitation on analog input. Refrain from using touch with the CC3200, otherwise you may zomibify it. The SPI interface is slower to the 8-bit parallel connection. Here is a comparison between the two screens using the standardised test Protocol100, here performed on a Tiva C LaunchPad. The SPI port implementation is slow, especially on the MSP432. Another limitation, the SPI interface doesn't allow reading the colour of a given pixel. This limitation comes from the controller SSD2119. Texas Instruments has its official MSP Graphics Library to support the screen. For Energia, I've adapted the screen-specific functions to fit into the LCD_screen Library Suite. 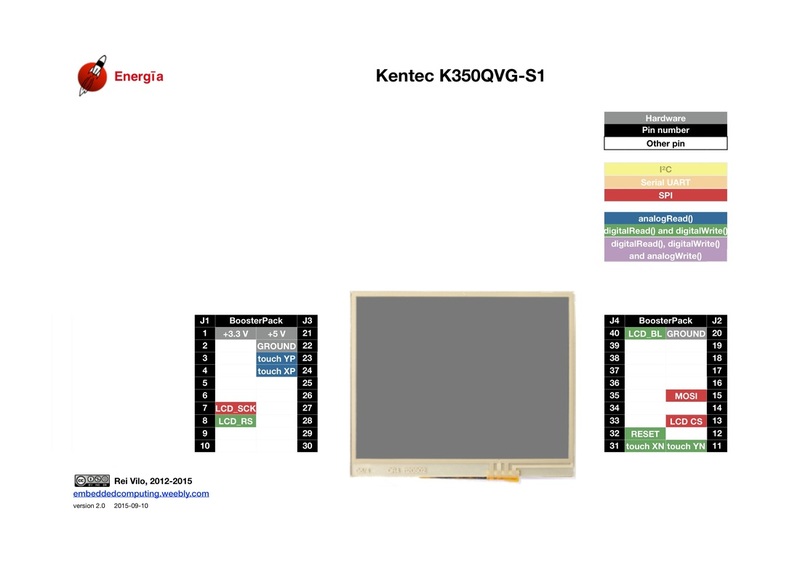 This LCD_screen library includes high level graphics and GUI elements.